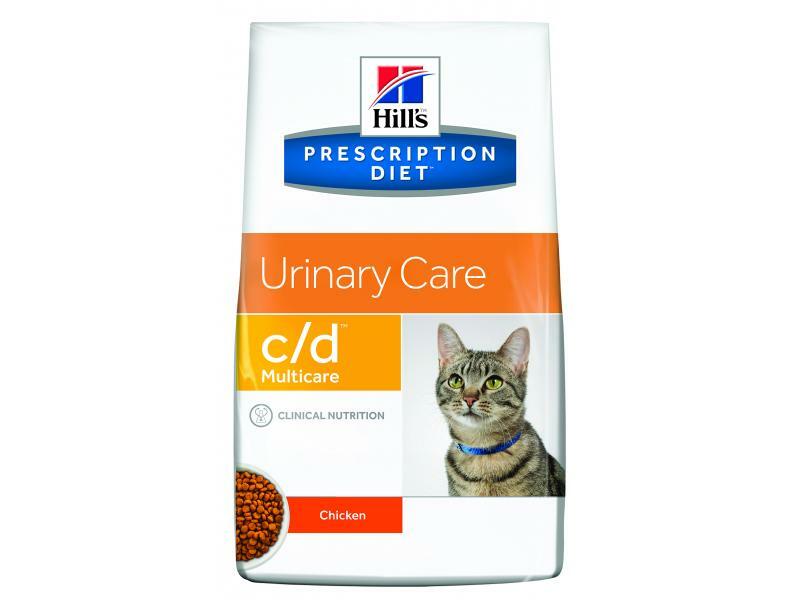 Hill's Prescription c/d Urinary Multicare Cat Food range contains ingredients which are designed to reduce the chances of crystals of struvite or oxalate from forming in the urine. 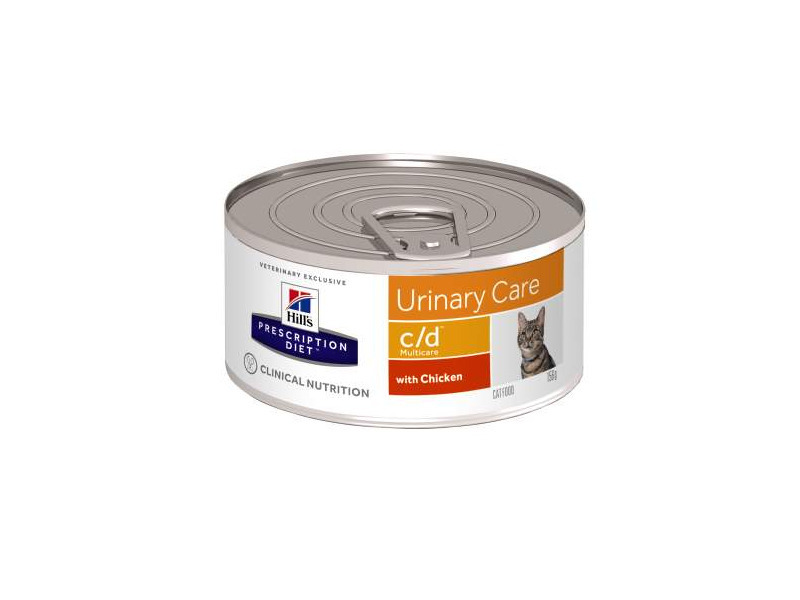 It is also helpful in the canned form for the prevention of many cases of lower urinary tract disease where the precise cause cannot be found. A high fluid intake will also help with these cases, so water consumption should be encouraged if possible. Providing fresh water in different locations in the house, away from the feeding area, will often encourage drinking. Available in Chicken flavours in wet and dry form as well as in Reduced Calorie. Salmon comes in wet form and Ocean Fish in dry. 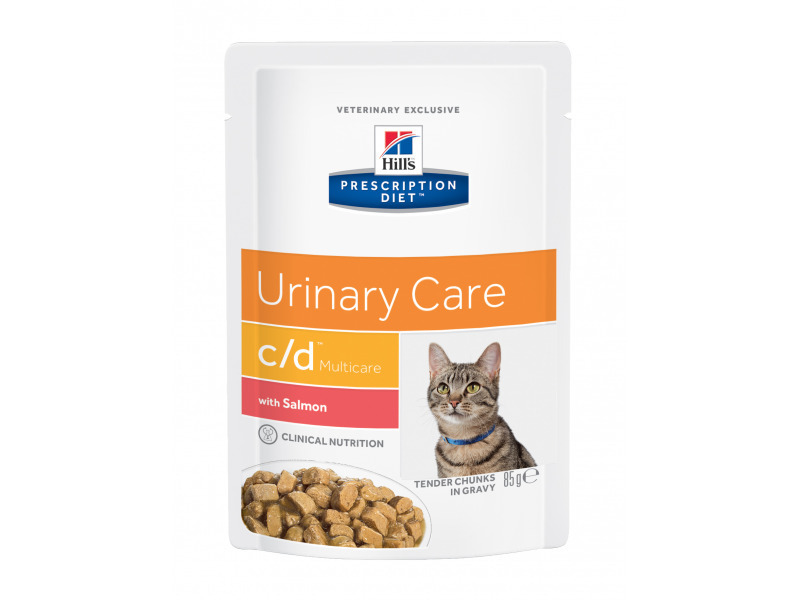 "Reduced Calorie" is nutritional and is clinically proven to dissolve struvite stones in as little as 14 days for overweight andobese-prone cats to help control their weight. These packs reduce calorie intake through controlled fat, offer high levels of L-carnitine and is clinically proven to maintain lean musclemass, while high levels of Omega-3 fatty acids help reduce discomfort. Great tasting the "Reduced Calorie" food is also available in pouches. These ranges are a starting point only, because cats' needs vary. Adjust the feeding amount to maintain the optimal body weight. These ranges are a starting point only, because cats’ needs vary. Adjust the feeding amount to maintain optimal body weight. Calcium Reduced Decreases urinary concentration of struvite constituents (magnesium and phosphate) and calcium oxalate constituents. Citrate Added Forms soluble complexes with calcium to reduce calcium oxalate formation. Target urinary pH Acid: pH 6.2-6.4 Discourages the formation and aggregation of struvite crystals without encouraging the formation of oxalate crystals. Water Increased in pouches and canned formulas Increases urine volume, to dilute the constituents of all uroliths and to reduce recurrence of idiopathic FLUTD. Formulas 5 (2 pouches, 1 can & 2 dry). in IL 1 canned formula. Increases choice to encourage acceptance. Beta-carotene Added Helps neutralise free radicals to help combat urolithiasis. Energy & Fat Reduced Helps avoid weight gain. Fibre High Provides increased dietary bulk which aids satiety and avoids hunger. L-Carnitine Supplemented Helps increase conversion of fat to energy. Helps maintain lean body mass. L-Lysine Supplemented Helps preserve lean muscle mass. Magnesium Phosphorus Calcium Reduced Decreases urinary concentration of struvite constituents (magnesium, phosphate) and calcium oxalate constituents. Sodium Controlled Helps maintain healthy kidney function. Target urinary pH 6.2 - 6.4 Discourages the formation and aggregation of struvite crystals without encouraging the formation of oxalate crystals. Vitamin E & Beta-carotene Added Helps neutralise free radicals to help combat urolithiasis. Vitamin C Not added It is a precursor of oxalate. Chicken (35%): Rice, poultry meat meal, wheat, maize gluten meal, animal fat, digest, minerals, fish oil, soybean oil, vitamins, taurine, trace elements and beta carotene. Preservative and antioxidants. Ocean Fish (8%): Rice, poultry meat meal, maize gluten meal, animal fat, tuna meal, flaxseed, minerals, digest, fish oil, vitamins, taurine, trace elements and beta carotene. Preservative and antioxidants. Ingredients (Reduced calorie dry): Chicken: Chicken (30%) and turkey meal, maize gluten meal, brewers' rice, cellulose, maize, dried beet pulp, digest, flaxseed, soybean oil, fish oil, minerals, animal fat, vitamins, milk protein hydrolysate, taurine, L-tryptophan, crustacean shell hydrolysate (source of chondroitin sulphate), trace elements, pork cartilage (source of glucosamine) and beta-carotene. With a natural antioxidant (mixed tocopherols). Minced with Chicken (5%): Pork, pork liver, chicken, rice, maize starch, oat fibre, animal fat, maize gluten meal, fish meal, digest, calcium sulphate, fish oil, dried yeast, glucose, potassium chloride, taurine, dried egg yolk, iodised salt, potassium citrate, calcium carbonate, vitamins and trace elements. Chicken (23%), pork, cellulose, wheat flour, maize starch, tapioca starch, various sugars, pea protein concentrate, minerals, animal protein powder, fish oil, sunflower oil, DL-methionine, L-carnitine, vitamins, taurine, trace elements, cartilage hydrolysate, crustacean shell hydrolysate and beta-carotene. Coloured with natural caramel. Salmon Chicken liver, pork, chicken, salmon (4%), vegetable protein concentrate, tapioca starch, maize starch, wheat flour, vitamins, glucose, dried whole eggs, trace elements, animal protein powder, fish oil, sunflower oil. Coloured with caramel. 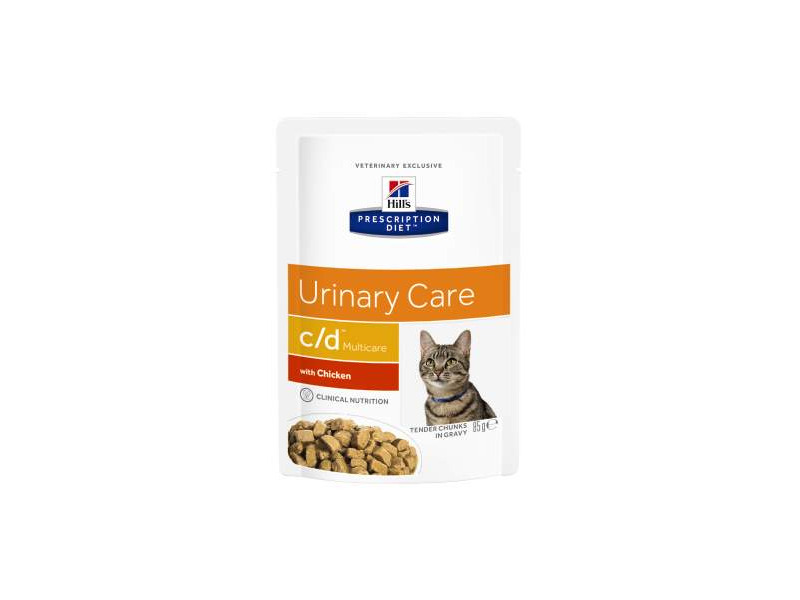 Monitor the urine, to ensure the target urinary pH is maintained, and if necessary eliminate urinary tract infection. 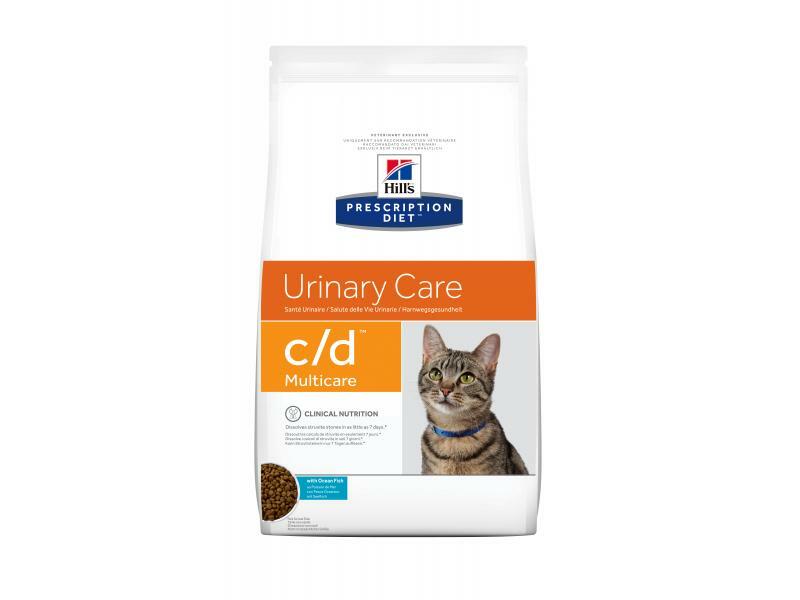 To dissolve larger or multiple sterile struvite uroliths: Prescription Diet™ s/d™ Feline. 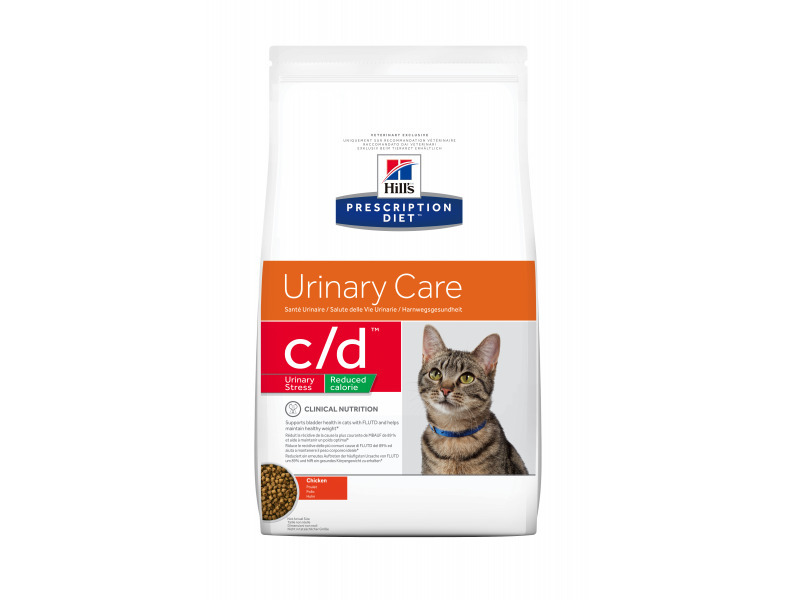 For FLUTD caused by urate, cystine or xanthine uroliths: Prescription Diet™ k/d™ Feline. 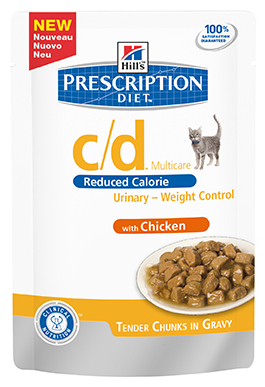 There are currently no questions for Hill's Prescription Diet c/d Multicare Urinary Care Cat Food - be the first to ask one!